Hard on the heels of the recent launch of the AES100, Aessent Technology today unveiled its new AES101 micromodule. The AES101 is based around the Cypress FX2 microcontroller and offers high speed USB capability (480Mb/s) on tiny 0.6” 32 pin sockets. 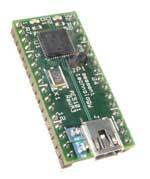 Like the AES100, the new micromodule gives access to ports A and B of the microcontroller. All of the 8 bit GPIF interfaces are accessible as well as the I2C lines.